Macross Wallpaper: Robotech - Do You Remember This? 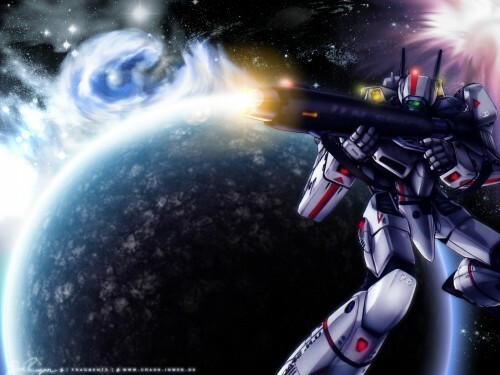 Minitokyo »	Macross Wallpapers » Macross Wallpaper: Robotech - Do You Remember This? Well I made /ANOTHER/ Robotech / Macross wall. I think this will be it though :) For a little while anyway. Again, I stick to things I like to do and not what will give me the most favorites. So here it is. I made the background using Photoshop. Scan was taken from the X-Box Robotech Video Game. I think the bot could use a little sharpening, but... it's not like it's ugly blurry or anything. It's just that in close contrast with the (sharp) distant stars like that, it looks a bit strange. Very good job, even tho i dont like rovotech over the real deal! :P , thanks. great wall you got here! nice bg and great use of the scan! awesome job! Awesome wall :) The effects are really cool looking. The only problem is that next to the awesome effects, the planet looks a little boring. Definitely a fav though. From "Macros Zero", a former thing watching me and I do not become precocious. :) The universe is very beautiful. I like the place which rolled this whirlpool. Even so, it is nice work !! wow, just awesome, I love the background, it looks so realistic! I really like the star field. It looks totally real! That blue flame looking thing around the planet is really cool too. I think that the one near the robot should look the same as the one on the planet. Or at least something similar. But kudos for the smudge work on it! I agree that the planet is a bit dull. Maybe it should have the same sharpness as the starfield behind it. I actually find it too big as well. Its occupying half the wallpaper. As for the image, I'm just not accustomed to seeing images at the far right edge of wallpapers. I think it should be a bit off-centered that way my eyes would be looking at the Robot first and not that big planet behind it. the starscape is awesome!! i luv the colours and everything!! mmm.... the planet is a tad dull but that's okay!! it still looks cool! Some spaceship starting from there or a meteorite rain going down would give it the details needed to give this area a more sophisticated look, every other area has these details already. Robotech rocks. It looks as if it's a lone soldier boy defending the planet all by himself. Like the planets. Good job. Ah Macross/Robotech... This is probably the one show which for ever molded my imagination. Well, it's good to remember your roots!